Catholic News World : Pope Francis to Widows "I invite you to keep your eyes fixed on Jesus Christ and to cultivate that particular bond that unites you to him." 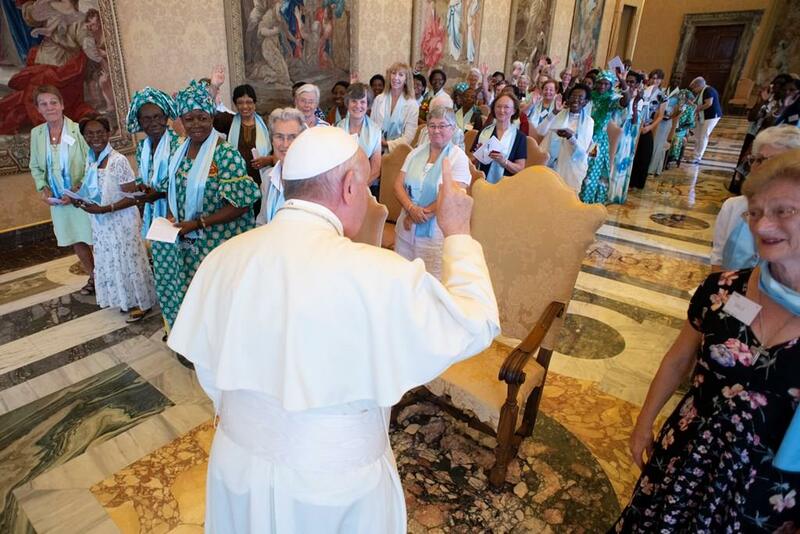 Pope Francis to Widows "I invite you to keep your eyes fixed on Jesus Christ and to cultivate that particular bond that unites you to him." TO THE CONSECRATED WIDOWS OF THE "FRATERNITY OUR LADY OF RESURRECTION"
AND THE "COMMUNITY ANNE THE PROPHET"
It is with joy that I welcome you on the occasion of your pilgrimage to Rome. Thanking you for your presentation, I would like to express my cordial greetings to the members of the "Fraternite Notre Dame de la Resurrection" and the "Community Anne the Prophetess", today implanted in several countries of the world, as well as to the priests companions, and, through you, to all those who are affected by the death of their spouse. "Widowhood is a particularly difficult experience [...]. At the moment when they have to experience it, some of them manage to transfer their energies, with even more devotion to their children and grandchildren, finding in this expression of love a new educational mission [...] "(Apostolic Exhortation Amoris laetitia, n.254). If this is true for most of you, the death of your spouse has also led you to discern a special call from the Lord and respond to it by consecrating yourself to Him for love and love. With you, I give thanks to God for the fidelity of his love which unites each one of you, beyond death, to his spouse and who has called and consecrated you to live today the following of Christ in chastity, obedience and poverty. "Sometimes life presents significant challenges, and through them the Lord invites us to new conversions that allow His grace to manifest better in our lives" to make us participate in His holiness "(Heb 12:10). (Apostolic Exhortation Gaudete et exsultate, n.17). Thus, by your consecration, you attest that it is possible, with the grace of God, the support and accompaniment of the ministers and other members of his Church, to live the evangelical counsels, while exercising his family responsibilities, professional and social. Your consecration to widowhood is a gift that the Lord gives to His Church to remind all the baptized that the strength of His merciful love is a way of life and holiness that enables us to overcome trials and to be reborn to hope. and the joy of his gospel. I invite you to keep your eyes fixed on Jesus Christ and to cultivate that particular bond that unites you to him. For it is there, in this heart to heart with the Lord, listening to his Word, that we draw the courage and perseverance to give ourselves body and soul to offer the best of ourselves through our consecration and our commitments (see Ibid., n.25). May you also, through your sacramental life, bear witness to this love of God which is for every man a call to recognize the beauty and happiness of being loved by Him. United to Jesus Christ, be leaven in the dough of this world, light for those who walk in the darkness and the shadow of death! By the quality of your fraternal life, within your communities, have at heart, through the experience of your own fragility, to make you close to the little ones and the poor, to show them the tenderness of God and his closeness in the world. 'love. In this perspective, I encourage you to live your daily consecration with simplicity and humility, invoking the Holy Spirit to help you testify, within the Church and in the world, that "God can act in all circumstances, even in the midst of apparent failures, "and that" he who gives himself and relies on God for love will certainly be fruitful "(Apostolic Exhortation Evangelii Gaudium, n.279). With this hope, in entrusting you to the Lord, through the intercession of the Virgin Mary, I give you the Apostolic Blessing, as well as to all members of the Fraternity of Our Lady of the Resurrection and of the Community Anne the Prophetess. And, please, pray for me as I pray for you! Thank you.